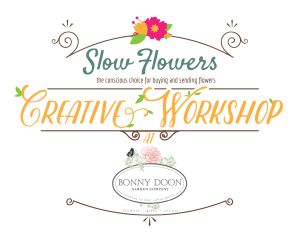 I want to start this episode sharing more details about the upcoming Slow Flowers Creative Workshop that I’ll be co-teaching with Teresa Sabankaya of Santa Cruz’s Bonny Doon Garden Co. on Sunday, August 21st and Monday, August 22nd. This valuable experience is designed to help you clarify, document and communicate your personal aesthetic message as a floral professional. In a safe, supportive and intimate setting, our small group will focus on YOU! We’ll go deep into Slow Flowers “brand building” as each participant finds his or her own voice as a floral storyteller. If you’ve been thinking about investing in your businesses’ future, now is the time to sign up. Today’s podcast interview features my conversation with Teresa about some of the content that we plan to cover. 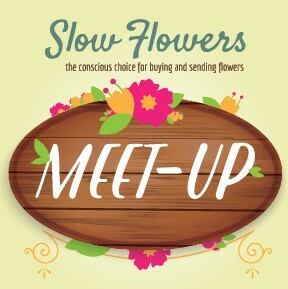 You’re also invited to join the Slow Flowers Meet Up from 3-6 pm on August 22nd! Check out details here. 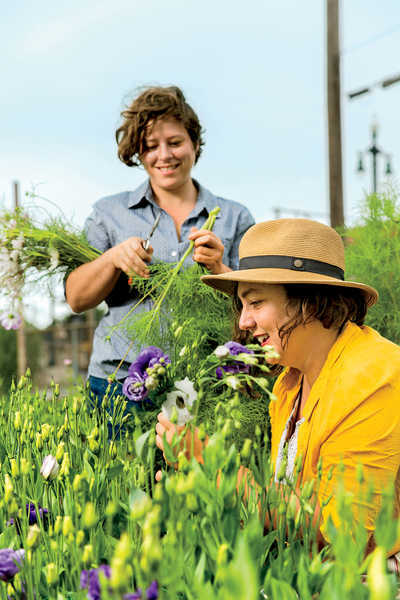 The farm-to-vase movement: Local flower farms sprout on urban lots around New Orleans. Susan wrote: “The mantra of the eat-local food movement is heading into the flower fields. Decades ago, that ethos began opening eyes to agricultural practices and sparking questions of how and where food is grown. 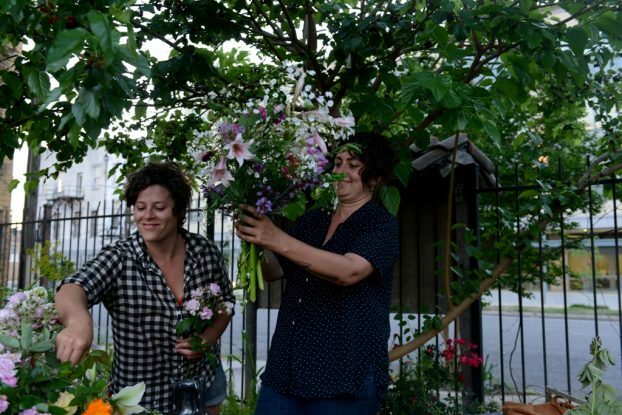 Now a nascent cut-flower farming industry in New Orleans hopes to get consumers to think as much about the provenance of the bouquets they buy as the food they eat. Susan quoted today’s guest, Denise Richter, who owns Pistil & Stamen, a flower farm with business partner Megan McHugh. She also highlighted veteran and emerging flower growers in the New Orleans Flower Growers Association, and she asked me to comment on the “trend” that’s called Slow Flowers. “It’s a gradual awareness in where our flowers come from. Food is way ahead… It’s the same customer who will ask in a restaurant, ‘Where was this salmon caught or raised?’ What’s the food mile? What’s the flower mile?”Foodies and gardeners “get it first,” Prinzing said. When the story was published Slowflowers.com was literally two months old and no one from Louisiana had joined as members. Through the article, I connected virtually with Denise and other New Orleans Flower Collective members and invited them to join Slowflowers.com. The New Orleans Flower Growers Association (NOFGA) is a small group of New Orleans based flower growers that share a love of growing and a commitment to natural and sustainable practices. Growers exchange knowledge, marketing and production resources to support a burgeoning organic and local flower production industry. NOFGA also connects buyers with the flower farmers who are producing locally and sustainable grown flowers. Last month, I met Denise in person. 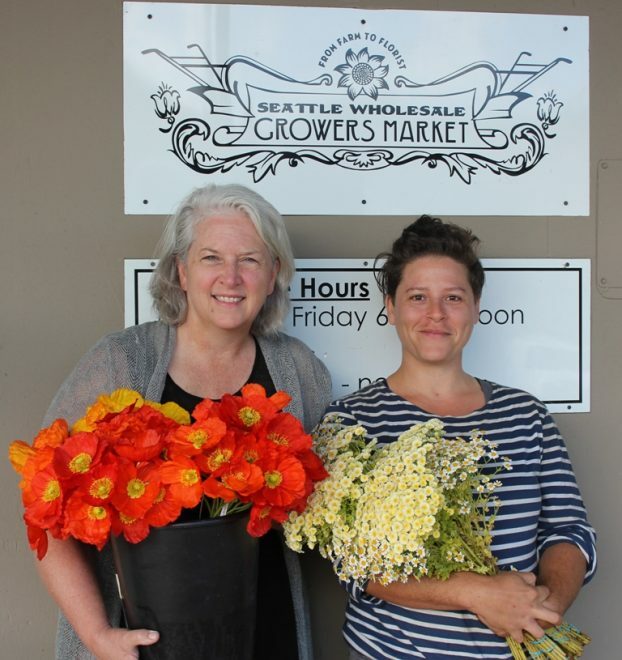 As you’ll hear in this episode, she visited the Pacific Northwest recently and was warmly welcomed by the Seattle Wholesale Growers Market community of farmers and florists. We met over pizza and beer when Diane Szukovathy and Dennis Westphall invited Denise to stop by Jello Mold Farm for a community gathering after the Market’s flower farm tour. 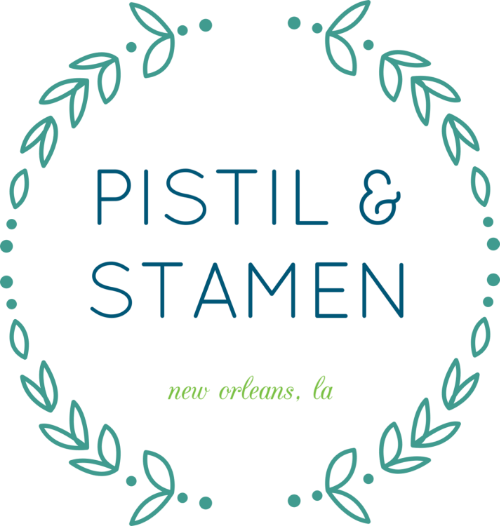 I was jazzed to make a human connection to someone I only previously knew through social media, but I couldn’t let Denise sneak out of town without turning on the recorder to capture a conversation with her about Pistil and Stamen. I asked her to update the Slow Flowers Podcast audience on the New Orleans flower scene, two years after that original article appeared. Denise Richter left a fashion career at Calvin Klein to study food systems and community organizing at NYU, and has been working on farms and urban gardens ever since. She came to New Orleans to start the Edible Schoolyard NOLA, an organization that aims to change the way students eat, learn and live in 5 public charter schools in the city. As a garden educator and garden manager for seven years, she spearheaded curriculum development, staff mentoring, and garden builds. Building garden classrooms that were as aesthetically pleasing as they were functional and educational, she has always loved and cared about making beautiful spaces for community members of all ages to enjoy. This extended to bringing the outside in, making bouquets from the garden for the cafeteria tables, front office desk and for special school events. Megan McHugh came to New Orleans to start a garden education program at MLK Charter School in the Lower 9th ward. With a degree in Literature and an MFA in Creative Writing, she has been always less interested in the nitty gritty science behind agriculture (soil scientist she is not!) than the utter delight and magic behind growing food and flowers. Her passion for creating meaningful and fun experiences for students within their regimented school day led her to garden education, along with her years of community gardening experience. When her small program lost its funding, she began working with Denise at ESY NOLA, developing gardens. She soon became the resident florist of the school, fielding bouquet requests regularly, and her plant choices became very influenced by her need for design material! This creative, multi-functional gardening is one reason Pistil & Stamen is so adept at using edible elements in their work such as unique herbs, peppers, asparagus and more. Seven years ago, we met over coffee to chat about our mutual profession, school gardening, and realized we had even more in common than that. Both of us having designed, tended to and taught in gardens throughout the city, we found in each other a shared passion for creating the most beautiful spaces we could – growing native plants, cut flowers and gorgeous perennials along with our veggies. Growing food for people on its own wasn’t enough. We wanted to grow beauty for them as well. And now, we happily hand our clients arrangements grown in urban gardens on St. Claude Ave and Oretha Castle Haley Boulevard. 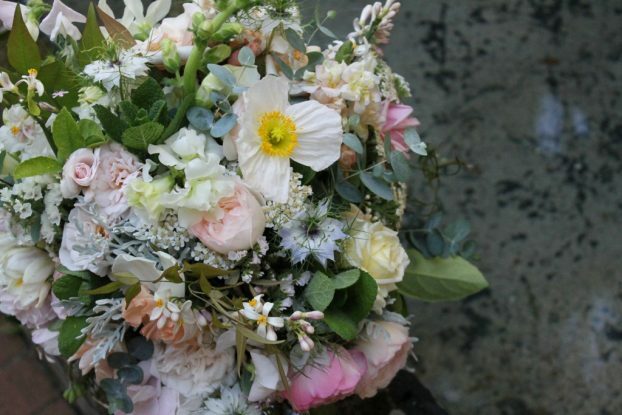 We design bouquets as we do our gardens – with respect for natural forms and movement. And we are quite pleased to create habitat for increasingly threatened pollinators, and that our gardens inspire many a passerby to stop and smell the roses, or the sweat peas, or the jasmine. Community-minded and eager to share these green spaces in the heart of our city, we love having people to our gardens for workshops, parties, and volunteer days. I love one point that Denise made about the New Orleans Flower Growers Association/Collective. She noted that the local media “would not have done a story about one of us – but collectively, there is a story.” I couldn’t agree more. If you are involved in an interview or photo shoot with media in your region, be sure to add a rich layer of relevance to the narrative by telling the writer or editor to the Slowflowers.com community. We can help give your story national context and validate that you are a pioneer in bringing local and sustainable flowers to the marketplace. Put that journalist in touch with me so I can share a voice of affirmation to what you’re doing. 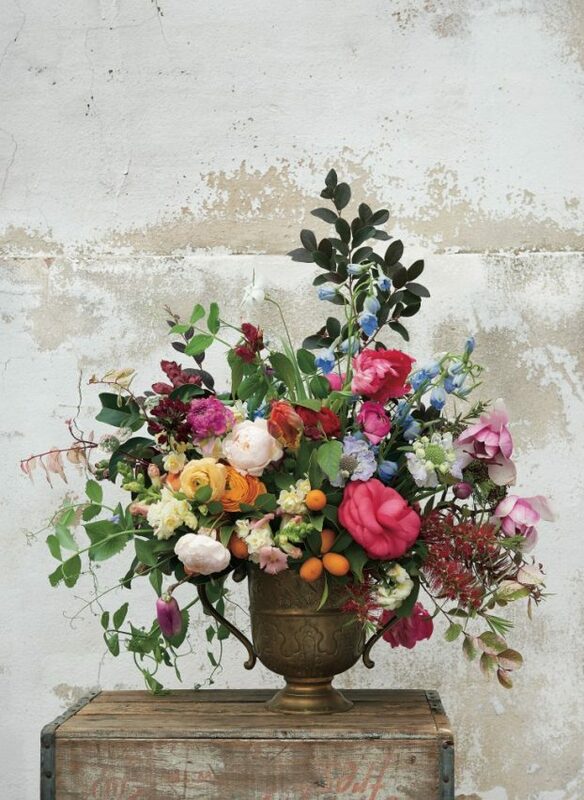 Don’t miss the opportunity to place yourself in the national conversation about domestic and local flowers. And please get in touch with me if you would like more statistics and sources to validate the metrics around local flowers. As always, I’m available at debra@slowflowers.com When you highlight Slow Flowers in your local press, you’re helping sisters and brothers in the Slow Flowers movement everywhere as well as yourself! 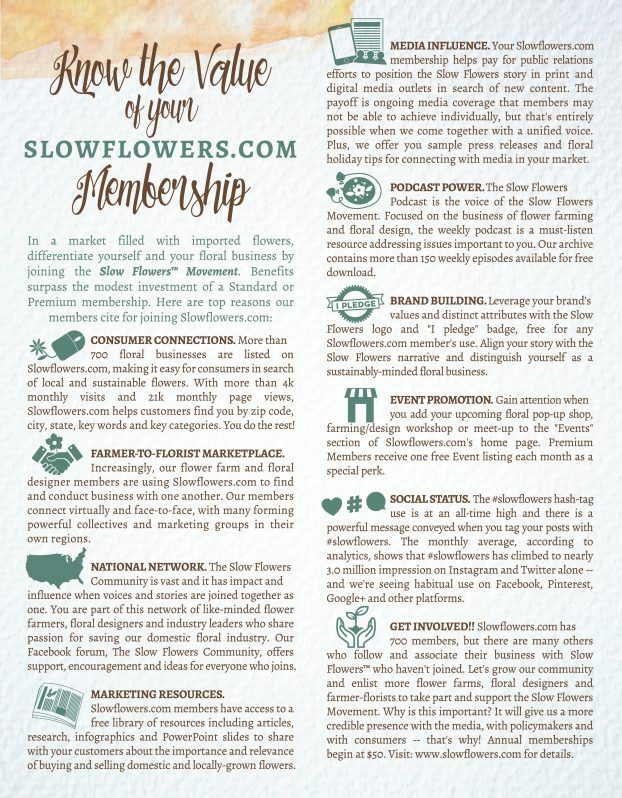 DIG DEEP: Our new collateral piece outlines the many benefits of your Slowflowers.com membership. This week we also published a new piece listing the Value of your Slowflowers.com membership. It’s a membership that is so much more than helping customers find you. It is about branding, marketing, connections and community. Download a high-res version of this piece here and share it with colleagues who’ve yet to invest in themselves or their businesses by being part of this important national cause. The Slow Flowers Podcast has been downloaded more than 110,000 times by listeners like you. THANK YOU to each one of you for downloading, listening, commenting and sharing. It means so much. This entry was posted on Tuesday, August 2nd, 2016 at 11:24 pm	and is filed under American Grown, Blog Posts, Creativity, floral design, General, Plants, Podcast Episodes, SLOW FLOWERS Podcast, Slowflowers.com the Directory of American Flowers, Writing. You can follow any responses to this entry through the RSS 2.0 feed. You can leave a response, or trackback from your own site.